Cooler Master, a leading manufacturer of computer chassis, peripherals, thermal solutions, and notebook coolers, is proud to announce two exciting and convenient additions to the Notepal series of laptop coolers. The Notepal series offers laptop cooling solutions that provide users with ultimate portability, hassle-free use, expandability, and, in many cases, customizable cooling layouts. It focuses on providing a user-friendly experience so that home users and frequent travelers alike will benefit from the many features offered by the Notepal series. Notepal gains a powerful new travel companion by adding the Notepal P2. With its highly compact, foldable, and ergonomic design, the Notepal P2 is sure to become a heavy traveler’s must have item. Its compact design allows it to fold which enables it to be easily stored in a laptop bag. Unfold the Notepal P2 and you have a powerful laptop cooler at your command that supports laptops sizes between 7” and 15.4”. Helping to protect a laptop from heat related damage, it utilizes two silent 60mm fans to cool hot spots. An adjustable stand provides ergonomic viewing and typing angles to assist in avoiding wrist fatigue and strain. Removable anti-slip knobs allow for an alternative level of height adjustment. Wherever a trip may take you, the Notepal P2 can be a true on-the-go companion to mobile professionals. 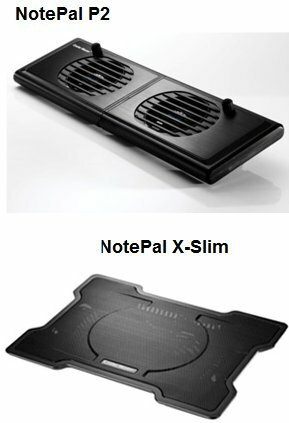 NotePal X-Slim: Slim Profile. Massive Cooling. Pushing the boundaries of slender profiles while maintaining high-performance cooling, this is the Notepal X-Slim. It’s powered by a huge 160mm cooling fan that is housed in a thin shell that is quite striking in its appearance. It features an aluminum mesh pad that lends to this visual appeal while also functioning as a means to minimize heat build-up when a laptop is experiencing heavy system loads. This extremely effective cooling system allows the Notepal X-Slim to cool laptops up to 17” with relative ease. Much like its Notepal P2 counterpart, it features a height adjustable stand that helps protect against wrist strain. Users need not worry about losing a precious USB port while powering the Notepal X-Slim as it comes equipped with a pass-through USB connector that powers the X-Slim while still leaving an available USB port for other important items like a MP3 player, portable storage drive, or other devices. Ensuring that the attached USB cable doesn’t add to the mess, the Notepal X-Slim is designed with cable management grooves to quickly and cleanly hide excess cables. Look forward to seeing the Notepal X-Slim for $19.99 and Notepal P2 for $14.99 after July, 12 2011 at retailers and online stores that sell your favorite Cooler Master, Choiix, and CM Storm products.